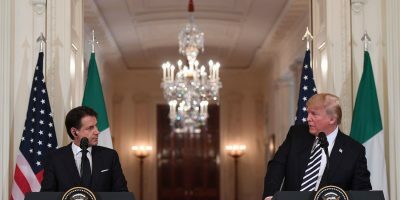 US President Donald Trump and Italian Prime Minister Giuseppe Conte hold a joint press conference in the East Room of the White House in Washington, DC, July 30, 2018.? In the wake of the disastrous G-7 meeting in Quebec, tension-filled NATO summit in Brussels, and widely condemned lovefest between the Russian and U.S. presidents in Helsinki, all in the past few weeks, the popular narrative has focused on the United States as a trans-Atlantic disrupter and Europe as a possible savior of the liberal international order. Fair enough. My experience as the senior Europe analyst in the U.S. intelligence community under the Obama administration and first few months of the Donald Trump presidency gave me a front-row seat to the early stages of major disfunction and Trump?s hostility toward Euro-Atlantic institutions. The United States and Europe, however, have a common plague that should not be underestimated. Cultural displacement, masquerading as economic and border security anxiety, is chipping away at societal cohesion on both sides of the Atlantic. In the United States, the shockwave of Trump?s election in 2016 and the widespread appeal of his policies continue to magnify a gulf in political allegiance and ideology. This divide is perhaps most prominent on the issue of immigration, as indicated by polling on the administration?s abandoned policy of separating immigrant children from their parents at the border. Democratic and Republican voters were miles apart. Unfortunately for those seeking to stop the march of time, demographic change is coming quickly. Recent data from the U.S. Census Bureau shows an absolute decline in the nation?s non-Hispanic white population?and that for the first time, there are more children under the age of 10 who are members of minority groups than not. In 2000, some 2 percent of Americans identified themselves as multiracial. By 2050, the multiracial population could rise to over 20 percent. By 2045, white Americans will no longer be the majority in the United States. Europe?s experience with identity?both at the national and supranational level?has been quite different: In many European Union countries, diversity is a newer issue than it is in the United States. While countries such as the United Kingdom, France, and the Netherlands have had significant histories as colonial powers and subsequent experience with robust immigration, most European countries are considered fairly new immigrant nations compared to the United States or Canada. What can the United States and European countries learn from each other?s experiences contending with these turbulent forces? Perhaps the core lesson is how many similarities there are in the populist and nativist messaging both sides of the Atlantic are facing, and thus in the shared challenge for those of us who oppose it. Divisive leaders in both North America and Europe are pushing narratives about immigrants and migrants stealing jobs, immigrants and/or Muslims threatening security, political correctness impeding the ability to speak one?s mind, the mainstream media lying, and the establishment selling ordinary people out for the benefit of the less deserving. In addition, in both the United States and Europe, a prevailing account of contemporary politics tries to explain nationalism and populism as rising in lockstep with growing inequality and social exclusion. The fact that ethnic nationalist leaders have become stronger in well-off societies with educated populations and generous welfare states provides evidence of a stronger driver: cultural backlash against perceived changes in social values and norms concerning religion, education, security, and other matters. In the end, these perceptions?stoked by unscrupulous politicians?as opposed to objective economic indicators, can have a more powerful impact. Of course, there is plenty the United States can do to get its own house in order. In particular, the country needs to put furthering tolerance and a respect for diversity back on its policy priority list, as it was when I was a deputy assistant secretary of state for European and Eurasian Affairs in the early Obama administration. In addition to the Trump administration revamping its heartless policy prescriptions for asylum-seekers on the southern border, Trump himself must dial back his hostile rhetoric regarding immigrants, which provides powerful fuel for those who are already fearful. In addition, the Trump administration must make a much greater effort to increase diversity in its own ranks?it has among the fewest minority senior leaders in decades. U.S. credibility among other nations, or as a partner on public diplomacy programs intended to reduce ethnic and cultural friction, depends on it. The United States and Europe also have a great deal of work to do on figuring out how to better balance harnessing the diversity and change needed for economic and social growth while at the same time reaching those who feel left behind. A good place to start is to stop framing the populist, ethnic nationalist challenge as just about the economy. A talented demagogue can make the rich feel that they would be twice as wealthy without some unwanted group or system holding them back. We need to address, head-on, some Americans and Europeans? underlying cultural fears.